Cycle Dispatch Delivery is a reliable radio-dispatched expedited courier service offering flexible, fast and convenient deliveries that are crucial to your business. Cycle Dispatch was established in 1986, and continues to grow under the leadership of President and Owner Deborah Santerre. 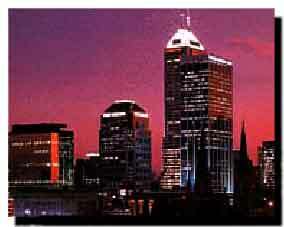 Serving one of the fastest cities in the mid-west. The team at Cycle Dispatch believes that it's not just about delivering packages, it's about delivering peace of mind. We know how costly it is to utilize an employee to perform a special or expedited pickup and/or delivery. Whether fulfilling a commitment to a valuable customer or meeting your own business need.... That's where we fit in! "Neither Rain....Sleet ....Shine....or Dark of Night.... will keep these couriers from their appointed rounds." Sound familiar? 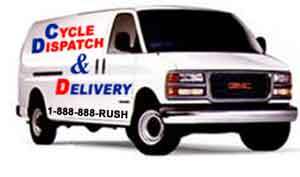 Cycle Dispatch simply guarantees professional on-time deliveries. That's our commitment to you. If for any reason we fail, it's free. Just call us at 1-888-888-RUSH or fill out the on-line form. Introduce your business and address, the pick up location and destination of your package, and what kind of time limits you're up against.